I am full. It was ok…I don’t think I would choose to make this for dinner but with the bag of food that I have it was quite alright and I have at least for at least one more meal. The ingredients of the casserole were: Kraft Dinner, can of tuna, can of mixed veggies, can of mushrooms, can of cream of mushroom soup. I mixed all of the ingredients that were being added to the KD in a casserole dish, mixed them well and heated them up in the microwave. 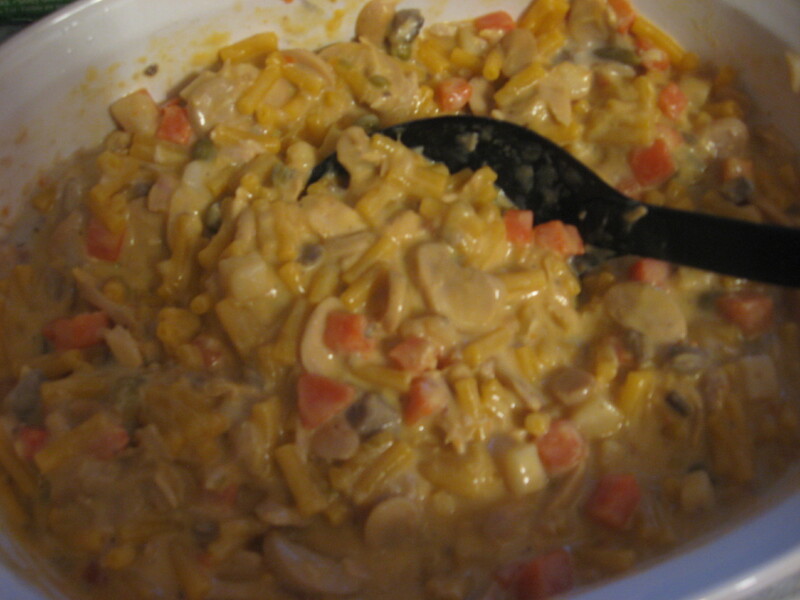 When the KD was ready I put it in the dish with the other ingredients and mixed it all together. I then put it back in the micro for a few minutes to heat the whole concoction up. The consistency of the mangled mess leaves something to be desired but the taste is not all bad. So I offer thanks to God for a full stomach when others will have no meal tonight at all. I must confess that I was a little surprised when I looked around and saw what is left from my bag for the rest of the week. With a plan in place I know that I will have enough to make it till Friday. Having to plan like this has also given me a new appreciation for the fact that most of the time, we do not need to plan more than a couple of hours ahead for food. It definitely takes a concentrated effort to plan a week of meals on the food that I picked up yesterday. Stay tuned. I will keep you all posted on my progress…. The next challenge will be tomorrow when I have to pass on meals at the K of C with our Wednesday group. So what is Catherinanne eating while you are doing this challenge?? I look at your food list, look at the concoction that you prepared for your supper, then I think of Rob, what would he do if he had to rely on a food bank and the bag of groceries that you have…..they say that you would do anything to survive, but I wonder if he would? 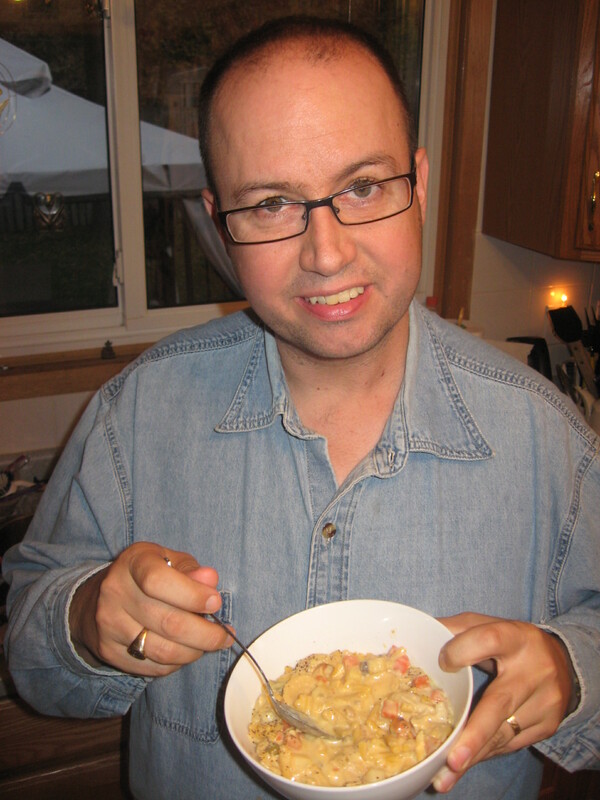 The kraft dinner he would eat…but nothing else I am sure. Good luck! You are almost there. Catherinanne is eating her normal meals. I felt that I might better be reminded of what I am missing if she was eating well…last night though she went to another room so I did not have to see the nice salad and the chicken etc while I ate my ‘delightful’ casserole. You are quite right about the food choices…there are things the the bag that I simply cannot eat and that limits my choices as well. For instance…I hate oatmeal…and creamed corn makes me gag …so those are out. I am really missing having anything but tea and water to drink…I am not a water drinker and I am thirsty most of the day….it is not helped by the sodium levels in these foods…. Sad part is there are people that cannot count down the days to getting into the produce section (I would kill for an apple or some grapes right now) or count down to going out for a nice dinner…it is counting down to when they will be allowed back for another bag of this food….something is terribly broken.